Whenever I read Wiman, or read about Wiman, I am reminded of the Church’s long history of mistreatment and silencing of the doubters and sceptics in its midst, of my own disquiet about the idolatry of certainty, and of my own hunger for honest conversation about the mysteries that lie most deeply in the centre of existence. I am also reminded that scepticism as well as faith ‘seeking understanding’ (after Anselm) involves not only some continuity with the past but also the constructive work of doing what Hans-Georg Gadamer famously refers to as opening ‘horizons’ of meaning where one learns ‘to look beyond what is close at hand—not in order to look away from it, but to see it better within a larger whole and in truer proportion’. Theologians, it seems to me, ought to champion the opening up of such ‘hermeneutic space’ for all those – whether so-called believers or sceptics – who simply cannot imag­ine any other way of the world being. This is one place where the work of artists like Wiman take on an almost indispensable role for the church, and perhaps especially in those parts of it which tend to be more than a little wordy (and a little nerdy!) – where, despite all claims to the contrary, what is communicated is that ultimate truths really can be captured by human constructs – not only in liturgical contexts but also in our other theological musings. My friend Cynthia Rigby recently identified Wiman as an example of one for whom the search for meaning constitutes ‘a kind of belief that … would not run nearly as deep were it void of skepticism’. Clearly, doubt and scepticism may be expressions of faith. Equally, belief may be an expression of a lack of faith, a mistrust and/or fear – the fear of not believing. All this is part of the complexity and ambiguity of scepticism. What sceptics and doubters need, Paul Tillich said, is not repression but courage which ‘does not deny that there is doubt, but … takes the doubt into itself as an expression of its finitude and affirms the content of an ultimate concern’. This is the kind of scepticism which is essential for the kind of theology that grown-ups do! St Ambrose once said that ‘it did not suit God to save his people by arguments’. Of course, arguments have their uses – encouraging the gift of clarification, for example – but they are no substitute for imagination, vision, and hope, truths not lost on the biblical writers. It is not insignificant that the Bible has no arguments for the existence of God. It is not insignificant that the Bible offers little reason to think that faith should be facile and unambiguous. Indeed, the Bible is unfilled by comfortable and reassuring words about the life of belief and trust. It is unfilled by presentations of a God who expects or demands doubtless faith. If Abraham and Moses and Hannah and Job and Mary and Jesus and Paul suggest any pattern, then our knowledge of God and of God’s ways is learnt not, in the first instance, by clinical enquiry and epistemological certainty but by being found caught up in a reality planned and constrained only by mysterious love, love which appears to have little difficulty in making space for angst and struggle and disbelief. Indeed, in a sense these are a kind of argument for God. Thanks for posting this, Jason. I’ve never come across this person before, but he certainly sounds worth following up on. Mike, I think you’d like Wiman’s work. Thanks for these! 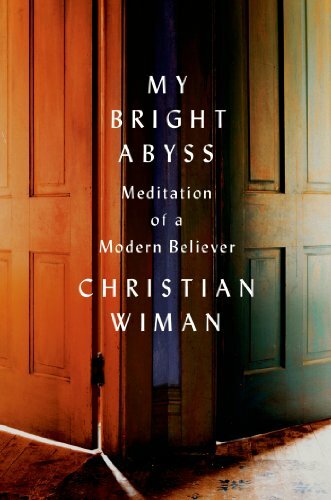 I’ve read My Bright Abyss five times in the last year and I guess I’ve become a Christian Wiman groupie. Wonderfully said, Jason, and thank you for pointing us to the interviews. Wiman is a treasure. Terrific x 2. Thanks, mate! @Tamara: Yes, and for McLeod Campbell this ability to question was grounded in the reality of divine love. What a saintly theologian! Thank you for drawing our attention to him again. @Joel & Kim: you’re welcome.